7.5" x 3.25" x 3.88", 2 lbs. Dull knives aren't just inefficient and frustrating…they can be dangerous, too. 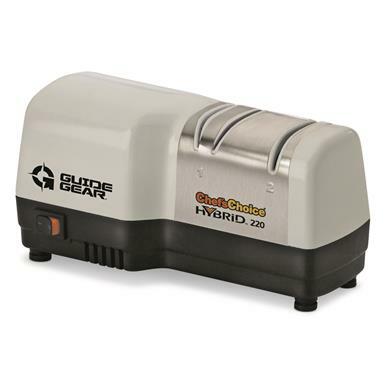 The answer is this compact, lightweight and easy-to-use 2-stage Sharpener from Guide Gear®! It returns all of your knives to razor sharpness in minutes. Use the first-stage channel with 100% diamond-coated disks to hone the edge, then switch to the manual second-stage stropping/polishing stage for a fine, clean-finished edge. Dimensions: 7.5" x 3.25" x 3.88"